Marine Education and Research Society - Humpback Comeback! See A Blow? Go Slow! 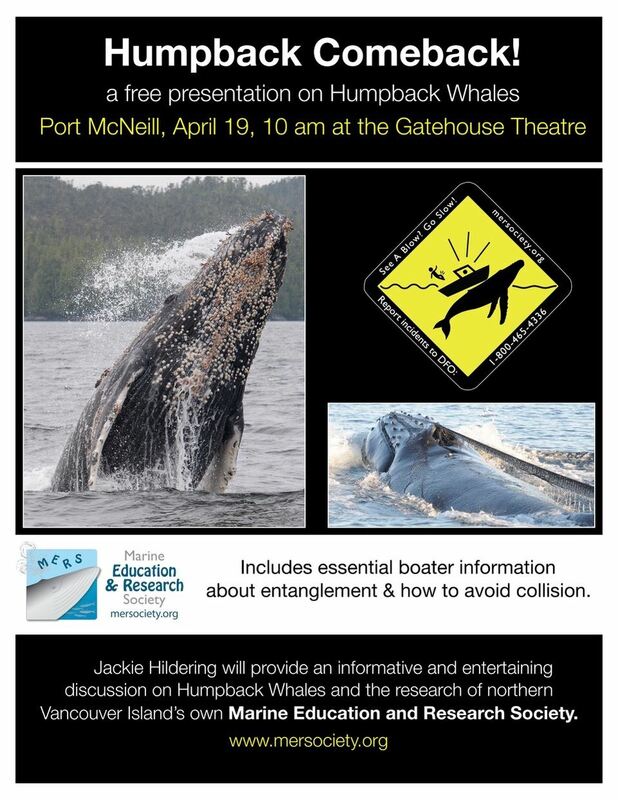 Join MERS for a daytime presentation about the return of Humpbacks to coastal BC waters; from 10 to 12 at the Gatehouse Theatre (1705 Campbell Way). The Marine Education and Research Society is based in Port McNeill with education efforts being coast-wide. In addition to sharing MERS’ research on Humpback feeding strategies and rate of entanglement, Jackie Hildering will discuss how the fortunate return of these giants from the brink of extinction necessitates increased boater awareness about avoiding collision, what to do if entanglement is witnessed, and the value of reporting incidents of disturbance. Marine Education and Research Society research includes having documented a novel feeding behaviour of Humpbacks dubbed “trap-feeding” and determining that 50% of Humpbacks feeding off the coast of BC have entanglement scarring. As an educator, cold water diver and underwater photographer, she is known as “The Marine Detective” with on-camera experience including being featured on Animal Planet’s “Wild Obsession” series and in the BBC productions “New threat to Canada's Pacific Humpback Whales?” and “Ingenious Animals”. She has been awarded the Vancouver Aquarium’s MAN Award for Excellence in Aquatic Education (2010) and has been referenced as the standup comic of marine conservation. See www.mersociety.org. All photos on this site provided by and © Jared Towers, Christie McMillan, Jackie Hildering, and Heidi Krajewsky, unless otherwise indicated. Photos are not to be used without permission.